Assume that you are on the seventh floor waiting for one of three elevators. Car 1 can arrive in 15 seconds but the total wait time will be 25 seconds because it has a stop on the eighth floor. Closer, Car 2 is 10 seconds away and Car 3, only five. 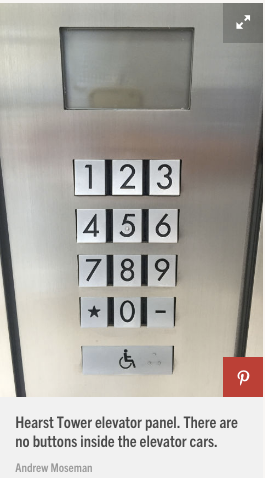 So, the elevator system sends Car 3 to pick you up. Usually though, it’s not quite that simple. The situation changes when we are told that Cars 1 and 2 are each occupied by one person while Car 3 is full. Then, we can add the wait and transit times for all the people in each of the elevators and for the person boarding to determine the most efficient choice. With 8 people in Car 3, it no longer is the best. One paper that I discovered creates a “pain index” by combining elevator wait and transit time. But even here it is not that easy because for some of us, a slow ride can be more unpleasant than a long wait. 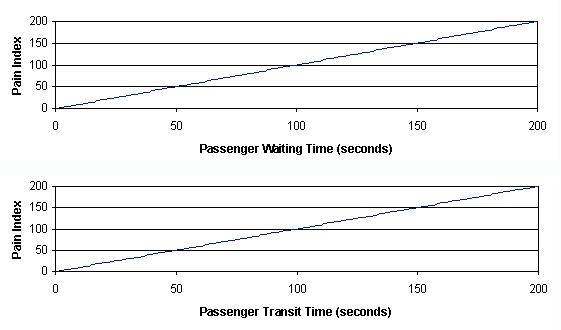 Below, if wait time is 10 seconds and transit takes 20 seconds then the “pain index” is 30. Elevators continue in the same direction when occupied or when they are heading to pick someone up who is going the same way. When all requests for a certain direction are satisfied, the elevator waits for the new call that can take it either way. With skyscrapers though, more complex algorithms are needed and some even ask you to enter your destination before entering so it knows which car to send. Sort of like an express train, one elevator then winds up with everyone heading for the same floor. Deciding between wait and transit time, empty or full cars and a host of energy alternatives, elevator algorithms are all about tradeoffs. And yes, when those tradeoffs minimize cost, we can say that our lives have become more efficient. So, next time you push that elevator button, do consider all of the decisions that determined how long it would take to reach the 10th floor. My resources: For more detail about elevator economics, I recommend this Popular Mechanics article, the Conversable Economist and this discussion of elevator algorithms.